Kuzhi Paniyaram is a small, round ball of rice flour deep fried in oil. This results in a crispy snack with a soft, chewy center. You could liken this to Medhu Vadai, except that medhu vadai uses only urad flour, while kuzhi paniyaram uses rice and urad flour. Unlike medhu vadai, you need a specialty pan to cook these. The traditional ones are made with cast iron or brass. The more modern ones are nonstick coated. Due to the benefits of cooking in cast iron cookware, and the possible side effects of cooking with nonstick cookware, I use a cast iron pan for this. A properly seasoned cast iron pan could develop nonstick characteristics and will require little or no oil. I bought mine at cooking.com . Go ahead, click on that link. Cooking.com does not even know I exist on this planet! It is an Aebleskiver pan that is used in Danish cooking. But, it looks and cooks just like the South Indian Kuzhi Paniyaram pan. 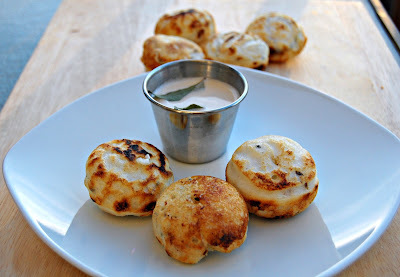 The kuzhi paniyaram batter is prepared much the same way as idli batter. Aromatic spices are added to the fermented batter. Rounded spoonfuls of batter are ladled into the seasoned aebleskiver pan and cooked similar to turnovers. Growing up, I remember one of my neighbors cook these frequently. 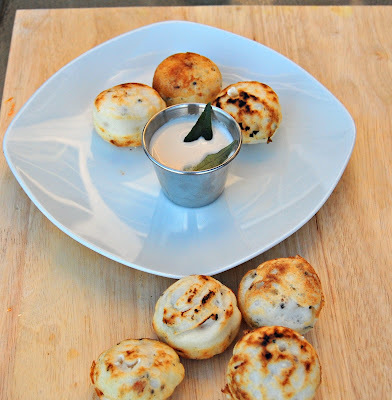 She would pour oil on top of the filled molds and effectively deep fry the paniyaram in the confined environment. Of course, using that much oil is considered a sin now :) So, I try to use just a tablespoon. Wash and soak idli rice and urad dal together in fresh water for 4 hours. Grind it coarsely (to the consistency of idli batter). When you are ready to make the paniyaram, finely chop green chilies, curry leaves and ginger. Chop the coconut into 1/2 inch square pieces. In a small kadai or saute pan on medium fire, add 1 tbsp of oil . When it is heated, add mustard seeds and cumin seeds. When the mustard seeds splatter, add in the chopped green chilies, curry leaves and ginger. Once the ginger has fried, remove from fire. Stir in this seasoning into the prepared batter. Also add the chopped coconut. 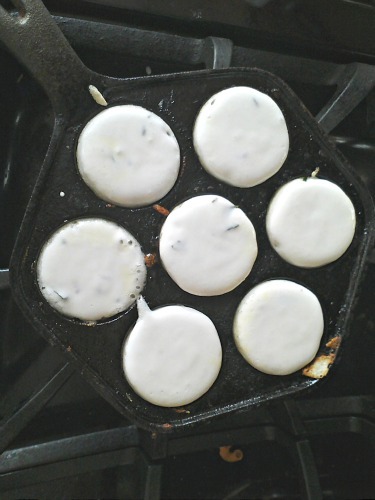 Season a kuzhi paniyaram or aebleskiver pan with 1 tsp of oil. Use your fingers/paper towel or cheesecloth to swipe the surface of the concave rounded molds with this oil. Start this pan on medium high fire. When the pan has heated up, lower the heat to medium low. With a rounded spoon, spoon in the seasoned batter in to the rounded molds. The batter should be level with the rim of each round mold. Cook uncovered for about 5 minutes. If you insert a bamboo skewer in the middle of the paniyaram, it should come out clean (very similar to cake doneness test). Using the skewer, flip the paniyaram and let the other side cook for a couple more minutes. When completely cooked, remove to a plate. Scrape out dried batter (if any) and season the pan again (only if needed). Repeat steps 5 through 9 until all batter is used up. To up the nutrition value and eye candy, you could add a few tablespoons of grated carrots or cabbage to the batter. Skip the part on preparing batter and instead use leftover idli/dosa batter. Oiling the cast iron pan before the first batch is essential. This ensures that the cooked paniyaram is released easily from the pan. Once the pan has heated up, lower the heat and maintain it. Cast iron takes a while to heat up and retains heat for a long time.